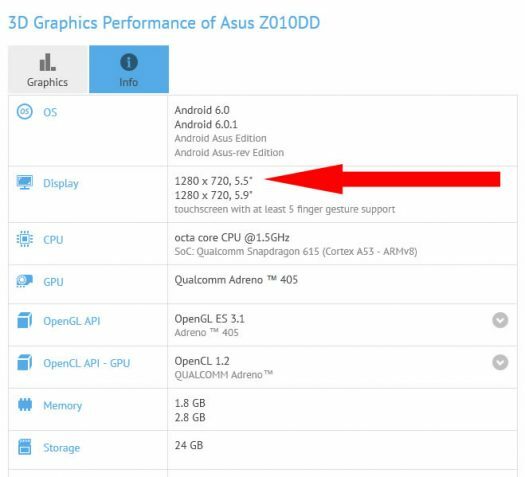 It was back on January 21, 2016 when two mysterious Asus phones were spotted on GFX Bench. Those two models were listed as Z010DD and Z012D. There was obviously rampant speculation during that initial leak, but now we may have more details which could potentially connect a few of the dots. First let’s look at the Z01DD. 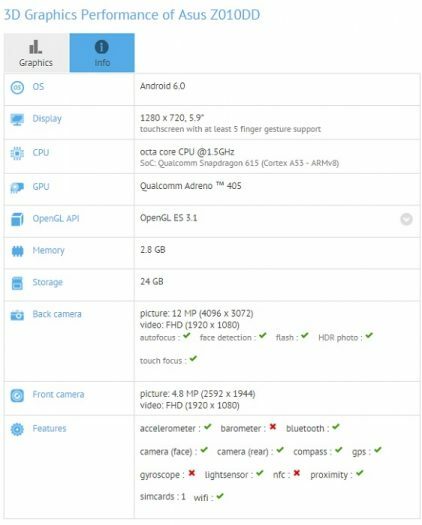 Those benchmarks revealed the following: 5.9-inch screen, 1280 x 720 resolution display, octa-core Snapdragon 615, Android 6.0 Marshmallow, 3GB RAM, 32GB storage, 12MP rear and 5MP front camera (both cameras capable of recording full HD). This was originally discovered January 22, 2016. 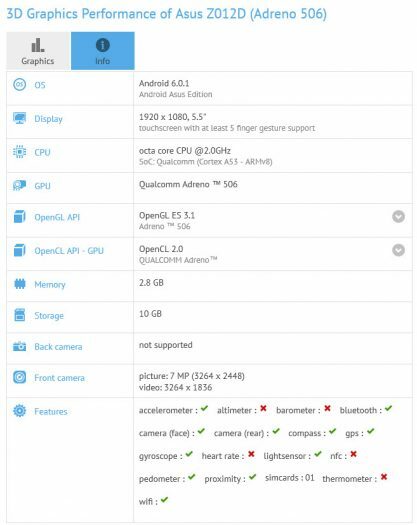 However, upon further inspection, we can see there is a 5.5-inch screen model listed and it shows that model as having Android Marshmallow 6.0.1. The plot indeed thickens! 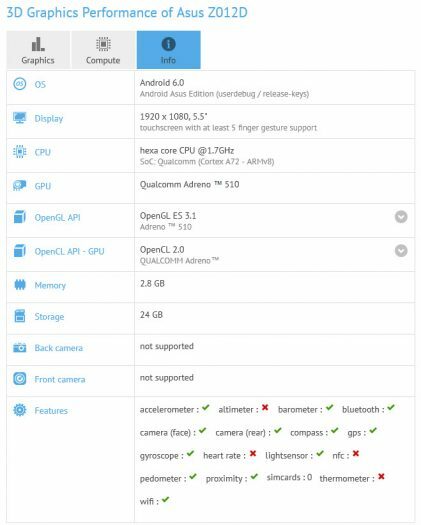 So we can say for almost certainty, that the Z010DD is in fact the Zenfone 3 Max. The 5.9-screens doesn’t make a lot of sense given the 1280 x 720 resolution so we are prepared to say the new Zenfone 3 Max will be 5.5-inch size. Is it possible that Asus is releasing 2 models of the Zenfone 3 Max, one with a phablet sized screen? Certainly this is possible given the fact that Asus officially stated that they expect the Zenfone 3 Max to be 2/3 of their Zenfone 3 sales. Next is the Z012D (A: January 21: 2016). The benchmarks discovered the following specs: 5.5-inch screen, 1920 x 1080 resolution, hexa-core Snapdragon 650 processor, 3GB RAM, 32GB storage, 12MP rear and 5MP front camera. Next let’s look at a more recent Z012D variant (B: April 21, 2016). Those benchmarks listed the following: 5.5-inch screen, 1920 x 1080 resolution, octa-core Snapdragon 625, 3GB RAM, 16GB storage, 8MP front facing camera (rear camera specs unavailable). So what to make of the Z012D and the two variations? It’s possible that the newest benchmark is the Zenfone 3 flagship phone. We have considered whether one of these versions might be the more premium Zenfone 3 Deluxe, but there isn’t anything leading us in that direction. When we think of most premium model, we expect to see 4GB RAM and none of these benchmark models have that.